Hindenburg - Very Much Worth the Effort. Finally finished the KM cruiser grind - though to be fair, it was pretty easy as "grinds" go. There were a few stand-outs in the line - the Karlsrue and Nurnberg were both very enjoyable, though I didn't amass a significant number of matches in either. The Roon was very good - and it now holds my damage record at 245K, though I didn't find it a really enjoyable ship to play. That single turret forward doesn't make it a very strong "push" ship - I found her much better suited to longer range kiting. Effective - but not all that engaging. I purchased the Hindy today - and was well prepared, having seen her featured often on Panzerknaker - and I was not at all disappointed. Trolly armor - especially charging bow in - point and click shell velocity - punishing AP - highly effective HE and fire chance - short range torps, but so many of them and really excellent arcs. And when the typhoon rages - she is at her absolute strongest - load AP and fire up the hydro. She really is the complete package. My port also includes such borderline OP premiums as Nik, Grem, Fujin, Scharn, Belfast and Kutu - but this is the first time I've played a tech tree ship so far ahead of it's contemporaries. Granted - my battle count in Hindy currently hovers at a lofty 6 matches - but its pretty obvious that this is the start of something beautiful! Its only a matter of time before she smashes Roon's hold on my damage record. Couple of screen grabs from the results screens. Had one loss in those 6 matches - and even there she shone like a diamond. So - if you're grinding up this line, and find yourself in a bit of a lull - keep your eye on the prize, because its very much worth the effort. I do good in Hindy for the few times I have played her. When I get to tier 10 I have to work on other lines and types to get them to tier 10. Congratulations nice games. Congrats @ddoubletapp1, sounds like you really enjoyed yourself! Have you played a game that you're particularly proud of and want to share? 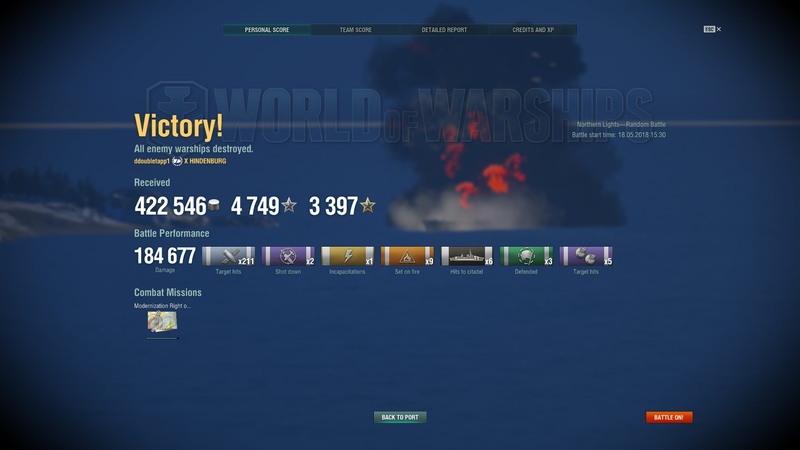 I think I'll be featuring quite a few Hindenburg matches on my youtube channel - she is the most "flexible" ship I've played so far - perfectly at home racking HE and fire damage at range using the spotting plane (this is the first ship I've run two different "special modules" on - spotting plane, and hydro - and she uses both very effectively) - and arguably even more effective right on the front line looking for citadel hits on those DMs and Moskva/Donskoi's that like to push in behind the DDs to use radar, and aren't expecting to find an opposing cruiser doing the same. I believe there will be a pretty good "highlight" vid, as well - match two was in a typhoon, and I manged to completely wreck a full health Montana with torps and AP (while surviving a full, close range salvo) in a passing engagement. You guys chap my hide. I picked Zao early on, really want a Roon with secondary build and Battleship Hindenburg. I keep telling myself I'm done grinding lines - and I have my Prinz that I really like. I guess I will start on the York soon and work towards Hindy. 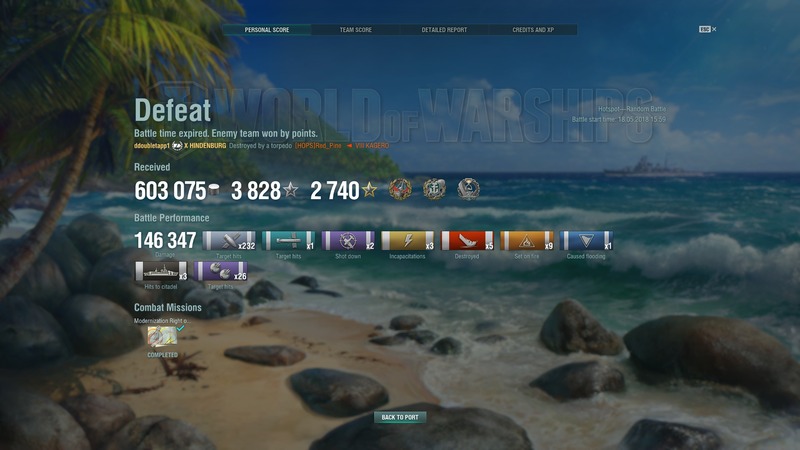 The Hindenburg is my first and only Tier 10, and part of the reason it's the only is that after playing it, I have a hard time wanting to go and play other ships, lol. Nice, I'm up to 11 tier 10s - I like all my ships - I just need to spend to to relearn them sometimes. Nice! Be sure to share the link with us when you get them up!